Loretta Adeline Hochs-prung, 85, of Glencoe, formerly of Brownton, died Monday, Aug. 10, 2015, at Glencoe Regional Health Services Long Term Care. Casket bearers were Mrs. Hochsprung’s grandchildren, Lee Keim, Jayson Hochsprung, Elyssa Piotter, Amy Guhl, Nicole Hochsprung, Justin Hochsprung and Logan Hochsprung. Honorary casket bearers were her great-grandchildren, Beau Keim, Camden Keim, Zach Hinderman, Alexander Hochsprung, Layla Hochsprung, Eloise Guhl and Beatrice Guhl. Interment was in the Immanuel Lutheran Cemetery in Brownton. Loretta Adeline (Birkholz) Hochsprung was born Dec. 10, 1929, at her parents’ home in Hutchinson. She was the daughter of E.C. (Emil) and Margaret (Carlson) Birkholz. She was baptized at home on Jan. 5, 1930, by the Rev. W.J. Schulze of Frieden Lutheran Church (founding church in 1950 of Peace Lutheran Church in Hutchinson). She was confirmed in her faith as a youth on June 11, 1944, by the Rev. Gerhard Schmidt at Immanuel Lutheran Church in Brownton. She was educated in Brownton and graduated with the Brownton High School class of 1948. She furthered her education at the College of Medical Technology in Minneapolis following graduation. On Oct. 14, 1950, she was united in marriage to Gerald “Gerry” E. Hochsprung by the Rev. R.W. Koepp at Immanuel Lutheran Church in Brownton. Their marriage was blessed with four children, and Mrs. Hochsprung always treasured time with her children and grandchildren. The Hochsprungs lived and farmed on the Hochsprung homestead in Round Grove Township, McLeod County. They had shared 53 years of marriage when Mr. Hochsprung died on May 10, 2004. She raised four children between 1951 and 1976. Once all four children were in school, she volunteered as a medical technologist at Brownton Schools, assisting with both school and public immunizations. She also joined Immanuel Lutheran Ladies Aid, serving as an officer twice, and was involved in Bible studies throughout the years. 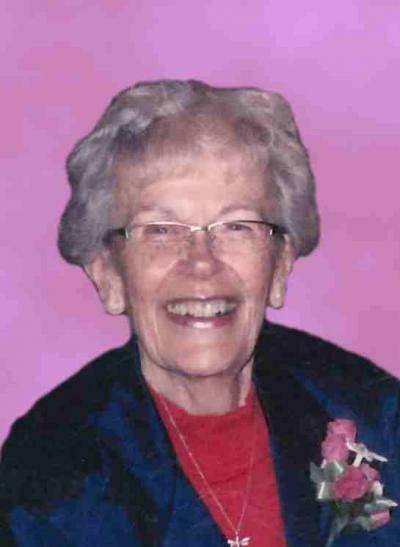 During these years, she also participated in a McLeod County Cooperative Homemakers Group, as well as trained to be a home health aide in the county. She enjoyed collecting antiques, reading, watching her husband Gerry play baseball, and making cookies. Her recipe, “Double Treat Peanut Butter Cookies,” was published as a prize winner by Farm Wife News in 1976. After all four children graduated from high school, Mrs. Hochsprung got involved in establishing the first-ever public library in Brownton as part of the Pioneerland Library System in west central Minnesota. She applied for, and was hired, as the librarian. While working at the library (1977-1982), she decided to attend Hutchinson Area Vocational Technical Institute (HAVTI, now Ridgewater College) in sales and marketing (1981-1982). As a student at HAVTI, she won the state DECA competition for best speech. Subsequently, from 1982 until retirement, she worked a variety of retail and/or manufacturing positions with McLeod County. She managed the Hallmark Store in 1984. Her last job as a teaching assistant for Brownton Schools, coming full circle back to Brownton Schools at the end of her working career. She retired in 1994. Mrs. Hochsprung briefly lived in Greencastle Condominiums in Hutchinson after her husband passed away. Since July 2009, she has lived at Glencoe Regional Health Services Long Term Care (GRHS-LTC) in Glencoe. While there, she served on the GRHS-LTC resident board, performed with its bell choir and joined GRHS-LTC Red Hats. Throughout her six years at GRHS-LTC, she was cared for with kindness and dignity. She is survived by her children, Kathryn (Ken) Keim of St. Charles, Ill., Lynn Hochsprung of Minneapolis and Joel (Jill) Hochsprung of Alexandria; daughter-in-law, Kathy Hochsprung of Brownton; sisters, Delores Gustafson of Colorado Springs, Colorado, and Mavis Martens of Hobart, Oklahoma; brother-in-law, Bob Hatlestad of Glencoe; grandchildren, Lee (Amy) Keim of Katy, Texas, Jayson (Laura) Hochsprung of Brownton, Elyssa (Michael) Piotter of Gaylord, Amy (Josh) Guhl of West Branch, Iowa, Nicole Hochsprung of Washington, D.C., Justin Hochsprung of Minneapolis, and Logan Hochsprung of St. John’s University, Collegeville; great-grandchildren, Beau Keim, Camden Keim, Zach Hinderman, Alexander Hochsprung, Layla Hochsprung, Eloise Guhl and Beatrice Guhl; nieces, nephews, many other relatives and friends. She was preceded in death by her husband, Gerald Hochsprung; son, Kyle Hochsprung; parents, E.C. (Emil) and Margaret Birkholz (Homburg); in-laws, Edward and Sophia Hochsprung; and brothers-in-law, R.W. (Robert) Gustafson and Will Martens.